This is a perfect example of "don't judge a book by its cover". The food is fabulous in this Mexican Store/Restaurant. Service is good, kitchen staff friendly. Best chile verde I've had in awhile. My BF had the chile Colorado. We'll be back next time we pass through Yuba City. Worth the mile drive off the highway. Service was excellent, the ladies were so polite. Chips and salsa were as everyone else described, delicious! The Chile Relleno burrito was amazing! Took a bit of work to get the burrito to close though. Would recommend this place to everyone! Amazing Mexican food! Some of the best hole-in-the-wall food I've ever had. The chili relleno burrito is so good it's stupid. An open burrito that you can add something like chili verde to. Getting in for the first time is awkward as you stare at the menu that is above the window to take orders which is also the kitchen. Just order and find a seat and be prepared for great food! So nicely done. Its a local store and restaurant, its a whole in the wall. The enchiladas are great here, delicious rice and beans. The taco's on the other hand were beyond great, totally authentic. The chips and salsa alone are worth it, fresh salsa and crispy chips. They are really nice, the food service is fast and they have outdoor seating. I didn't get a burrito but I saw one someone else had, it was huge! For the area (Yuba City) I don't think you could do any better than this. And the price point is way low. Finding places like this is the reason I look to Yelp. My daughter and I stopped in Yuba City yesterday to have lunch here based on the great reviews that I had read here, and we were NOT disappointed! The staff was Super friendly, attentive, and helpful. Since we had never been here before, it was taking us a minute to figure of the menu. She broke it down for us, and basically said they would make whatever we wanted, just tell them! We ended up with an entire of table of food, and our bill was only a tad over $20 dollars. The food portions here are HUGE, and EVERYTHING we ordered was excellent! And as others have mentioned, their salsa is amazing! If you are ever in Yuba City, and are graving the best mexican food you've ever eatin, you have got to stop here. By far the best Mexican food in Nor-Cal. Tell your friend tell your folks, Flores is amazing! 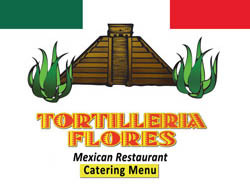 The best Mexican food in Yuba City and fantastic folks to serve you. The ambiance is not great but hey, it's what hits the plate that counts. Serving the greater Yuba-Sutter area for over 27 years. Our Catering Menu Serves from 20 – 800. Celebrating Birthdays, Weddings, Anniversaries, Baptisms & Special Events. Corporate orders welcome. Pick and choose your entree, sides and accompaniments. Served with rice & beans / tortillas, and salsa & chips or as sides. Click Here for a PDF version of the menu.